It's Super Bowl week! You know what that means...time for Super Bowl food posts!! If you like BBQ anything, you have to try this pizza. I'll admit I was a little hesitant just because I like traditional tomato sauce on my pizza. Isn't BBQ sauce for things on the grill? Think again! It's spread on as a light layer, so it adds a perfect amount of tang and the onions are a sweet touch and a little crunch. It's completely different than a traditional pizza, but in a good way! You can switch up what cheeses you use, too. Like maybe consider using blue cheese if you're a blue cheese lover? I mean, that's what they usually serve with BBQ wings right? Give it a try! One thing I know for certain is that you will love it! Chris and I ate the whole thing for lunch one day. And we have no shame. It was that good! Make pizza dough as directed. Spray a pizza pan with cooking spray or lightly flour a baking stone. Set aside. Sprinkle chicken with salt and pepper. Grill until cooked through, flipping halfway through. If cooking in the oven, lightly drizzle olive oil on both sides of the chicken and bake at 375 degrees F for 20-25 minutes or until cooked through. Let sit for 5 minutes and then slice into thin strips. Stretch out pizza dough on pizza pan or baking stone. Spread the BBQ sauce in a light layer on the dough. Sprinkle with both cheeses. 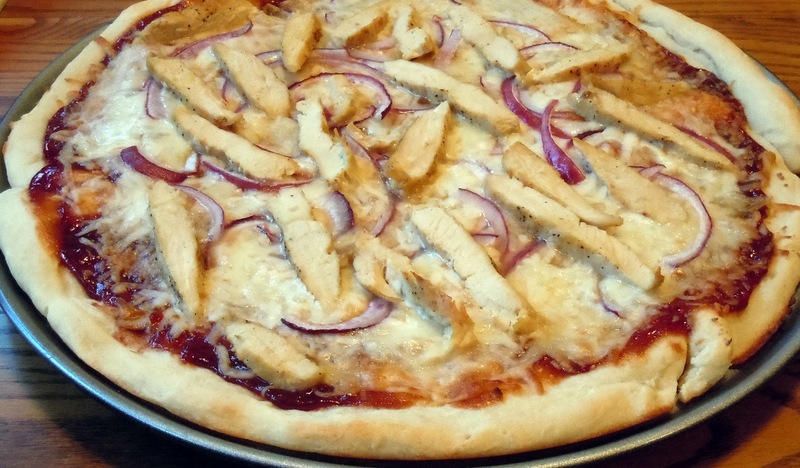 Top with sliced red onion and chicken slices. Bake at 325 degrees F for 9-13 minutes or until crust begins to brown and cheese is nice and bubbly. Let set for a couple minutes then cut into slices and serve! Looks so good! I cant wait to try this! That looks great! Better than California Pizza Kitchen!